Tattingstone was one of the first Suffolk villages I ever visited. I cycled out here one Autumn in the 1980s, shortly after I'd moved to the county. A few months before, Tattingstone Vale had been flooded for Anglia Water's massive new Alton Water reservoir, and the village was full of tourists gawping at the vast sheet of blue-grey that cuts the village in half. The shape of the lake is a diving shark, with the two halves of Tattingstone clustering around the narrowest bit. A wide bridge joins the parts of the village, quite out of scale with them, but no doubt a useful thing to have. On that occasion, newly-arrived from the agri-industrial wastelands of Cambridgeshire, I found Tattingstone quaint and sleepy. Today, I find it rather suburban, but it is me that has changed, rather than the village, I've seen so much else of Suffolk. And people continue to come to Alton Water, to canoe, and to wind sail, and to cycle around the perimeter. It has become an Ipswich institution. I hadn't been to St Mary for about ten years, but in the summer of 2008 a churchwarden of another church pointed me in the direction of a book called something snappy like A Photographic Guide to the Churches of East Suffolk, which had just been published. It wasn't a bad book, just neither one thing or another, a mugshot of the exterior of each church and a brief paragraph culled from other sources. What had struck the churchwarden, though, was that the author had seen fit to say rather unpleasant things about Tattingstone church. This seemed extraordinary to me. I remembered St Mary as clean and bright, full of 19th Century atmosphere, and obviously well-loved and looked after. Most importantly of all, it is open every day to pilgrims and strangers. What on earth was going on? I decided to head back to Tattingstone at the first opportunity. The church is in the southern half of the village, directly opposite the former workhouse. On my first visit here, this had still been in use as a hospital, but it closed soon afterwards. It became a ghostly relic, with boarded windows and overgrown flowerbeds, the whole thing surrounded by a security fence. Today, it is rather luxurious flats. The church is still neat, bright and well-kept; all pink-cheeked, as if fresh from its Victorian makeover. This was the work of Henry Hall, and in some ways was rather a drastic one, a reminder of quite what a parlous state the medieval churches of the east coast had fallen into by the middle years of the 19th century. The north porch opens straight onto the road, which I always like. It is as if the church were thoroughly integrated with its village. The graveyard spreads beyond, to west and south. But it does not have the secluded atmosphere of many in this district. Tattingstone is where the Shotley Peninsula begins, and, despite being close to both Ipswich and Colchester, the villages of the peninsula feel wild and remote. If you stand across the road from St Mary, you will notice that the tower has two curious buttresses which emerge from the roof of the nave. These are much later than the tower; its decorated bell openings reveal a 14th century origin, but the buttresses were probably part of a major overhaul in the 1680s, a time of confidence in the Anglican church. The nave appears 14th century too, suggesting that the church is all of a piece; but the font, and a window in the north wall, are at least 100 years earlier. The best single feature of the interior is a fabulous range of late 19th Century glass, which I think is all the work of the Clayton & Bell workshop. The main range is of Apostles and Martyrs, but there is a very fine window on the north side depicting Solomon and Zerubbabel, a reference to the building and rebuilding of the Temple in Jerusalem, perhaps a reference to what happened here in the 1860s. The memorials are worth more than a second glance. There is a classy late-classical memorial by John Flaxman, one of only two by him in Suffolk, but perhaps of more interest is the copper plate to the son of the Rector, killed in the Battle for Arras in the First World War. He had served at both Gallipoli and Egypt. There was a very brief fashion for these memorials, and although the design is not outstanding it is very much of its period. At first sight, you might think that St Mary has a sister church to the south, but in fact this is the 'Tattingstone Wonder', a cottage built in the shape of a church by Thomas White in the 18th century. You can see three photographs of it at the bottom of this page. 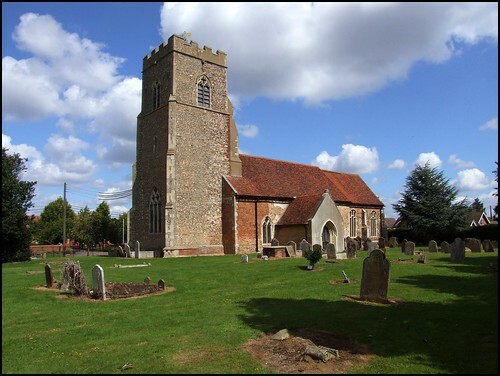 When I wrote about this church in 1999, I mentioned that I had come to Tattingstone at the end of a long bike ride, during which I had visited and photographed all twelve of the Shotley Peninsula churches. I'd set out from Ipswich in the blazing heat of a June afternoon, describing a clockwise route along the north and then the south of the peninsula. Tattingstone was my final stop, partly because it was an easy march back to Ipswich from here, but also because the village had one of South Suffolk's best pubs, The White Horse. After four hours and thirty miles, Adnams had never tasted so good. This ancient inn is hidden away on a road that disappears beneath the lake just beyond it, and at the time of my visit I observed that it had been threatened with closure. Nine years on, I can tell you, with great pleasure, that the White Horse has gone from strength to strength, and is as fine a pub now as it has always been, and well worth a visit - as is the beautiful, interesting church of St Mary, whatever you might read about it in books.